We’d love your help. 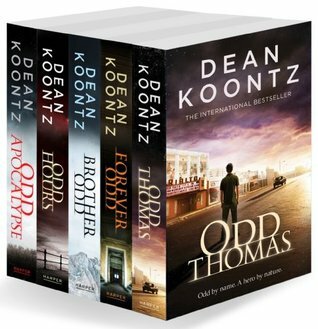 Let us know what’s wrong with this preview of Odd Thomas Series Books 1-5 by Dean Koontz. Small-town guy meets big-time evil. Five Odd Thomas novels from master storyteller and international bestseller, Dean Koontz. ODD THOMAS: Odd Thomas is a fry-cook who can communicate with the dead. And when something evil comes to Pico Mundo, the desert town Odd calls home, Odd is the only one who can prevent a devastating whirlwind of violence and murder. ODD HOURS: When intuition leads Odd to the quaint town of Magic Beach on the California coast, he takes a job as cook for a once-famous Hollywood actor. Disturbing dreams haunt his sleep, however, and nothing can prepare him for the nightmare that lies ahead. ODD APOCALYPSE: Just off California’s Pacific Coast Highway stands Roseland: a mansion, protected by high walls. Odd finds refuge there, with the mysterious Annamaria. But the house contains terrible and bloody secrets, and is haunted by lingering spirits. Roseland has welcomed them in, but will it ever let them leave? To ask other readers questions about Odd Thomas Series Books 1-5, please sign up. I love this whole series... Awesome read! This is my favorite book series of all time! It is full of good humor and suspense.